Tickets for “The Doctor” NOW ON SALE! Posted on October 21, 2013 by admin | Comments Off on Tickets for “The Doctor” NOW ON SALE! We’re pleased to announce that tickets are now on sale for this January’s world premiere improvised parody of Doctor Who, “The Doctor”. Get your preferred date now – or get two, since every night will be a new episode! 5 performances total – January 17, 18, 24, and 25th at 8PM with a 2PM matinee on the 26th. “The Doctor” is produced in association with Theatre Off Jackson. 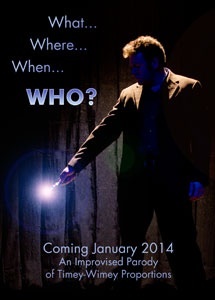 Comments Off on Tickets for “The Doctor” NOW ON SALE!